Is the Malaysian Church Alive to God? The Church & the Marketplace: Convergence or Divergence? Believers must be taught that their lives are not only about personal salvation and blessing, but also growth and discipleship. Discipleship involves discipline and dying to self. Too many believers focus on God blessing them and meeting their wants. However, being a Christian means embracing Gods agenda and the willingness to pay the price to advance His kingdom. There is no shortcut to spiritual health. Personal and corporate holiness and lives that honour God are the most basic prerequisites of a healthy church. Effective leadership is essential to its long-term sustainable growth. There is no point in being big but weak. A church full of immature selfindulgent believers may self-destruct. Egocentric leaders may attract crowd but does not contribute to true spiritual growth. My prayer is that this book will not only challenge us to self-examination, but also encourage us to live on solid spiritual food. The first church management audit ever conducted took place less than fifty years after the church had been established. The Auditor was no less than Jesus Christ Himself and His findings were published in Revelations 23. We do not know exactly why these seven churches of Asia were chosen or what their leaders might have thought of the appraisals. Some of the outwardly successful ones, perhaps Sardis or Laodicea, may have had no inkling about the assessment they would receive and could have been rudely brought down to earth. Others, maybe those in Smyrna or Philadelphia, had had little success and perhaps expected a low grade, only to be comforted by His sympathy and words of encouragement. Whatever the case, the Malaysian church can draw two conclusions. First, Jesus Christ personally holds each church accountable to Him. Second, the criteria used in this accounting can be radically different from the ones that are frequently used. Given the absolute seriousness of the matter to Christ, churches everywhere ought to be in a constant state of prayerful contemplation of their true spiritual condition. The basis for self-examination does not lie in the organisational or managerial but in the spiritual realm. Indeed, an absence of concern would strongly indicate that there is reason for concern. Apocalyptic literature cannot be taken too literally as words and imagery are often used for a desired effect. The fact that none of the seven Asian churches survive today, not even the highly acclaimed Ephesian church, may or may not therefore mean that they had their lampstands removed. This is a matter of speculation. Christ alone has the prerogative to rebuke, restore or remove and when this fact has been forgotten, trouble usually ensues. What the Malaysian church has to note is that hard work, great sacrifice and rapid growth are no guarantees that it will have a lasting impact. Christians also need to constantly remind themselves that while the church is a sacred institution, it is also an imperfect one. For all the claims to truth and transformation, church history shows the bitter truth that churches and their leaders have not been immune to base human motivations. In truth, some of the greatest acts of inhumanity and immorality have occurred when the church wielded the most political power. In the name of doctrinal purity and the removal of heresy, the church conducted programmes of imprisonment, torture and murder that lasted six hundred years. Those who wish to disassociate themselves from this bloody past should remember that the New Testament church itself was marred by leadership disputes, disunity, greed, materialism, sexual immorality and bad discipline. Today, the scandals that rock the evangelical church, both abroad and in Malaysia, serve as a cilice (a spiked belt worn around the thigh) to speak to ourselves of the ways that churches have brought dishonour to the Almighty. (Mt 16:18) and not that there will be no contest. Too often, we claim the victors prize before the race is finished and sadly this results in races never being finished. For better or worse, the Church Growth Movement (CGM) has permeated the Malaysian church to its roots. This movement has laudable aims but a critical question can be asked as Os Guinness does, namely, Will the church-growth movement remain self-critical, or has the reliance on the so-called new ground become an insidious new idolatry? 1 Others are even less generous, calling it the new apostasy. None of this is to say that the detractors of the CGM are wholly correct. To do so would be to discount the thousands upon thousands who have experienced real life transforming experiences and dedicated themselves to spreading the Word and discipling others. The key, as Guinness points out, is to be self-critical. In an age of mega-churches, super-personalities and hyper commercialism, it is all too easy to forget who the real head of the church is and who absolute primacy must lie with. Humans being humans, we are greatly impressed by large numbers, slick professionalism and grand claims. The branding and marketing of ministers and ministries have now made them so much more visible than Jesus Christ Himself. Often times He ends up being reduced to merely being a legitimising factor for, or an appendage of, mans programmes. In borrowing mass promotion techniques, the Malaysian church will want to be discerning and sensitive to the possible drawbacks of wholesale adoption. The advantage of using modern media is that messages can be communicated easily and fluently. In a world dominated by high expectations and low attention spans, and where the dominance of electronic broadcasting means that most messages have to be compressed into sound bites, the message of the gospel runs the danger of being sold little differently to detergent. Of even more concern are the subtle and not-so-subtle changes to the message. What exactly do new converts think they are being saved from and to? 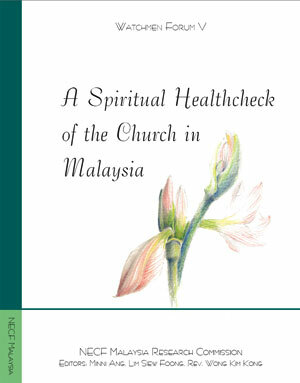 The practice of seeker sensitive services is not (yet) prevalent in Malaysia but the subtext of many evangelisation efforts today is that it is the promise of a more fulfilled, prosperous and healthy life rather than a restored relationship with Christ and, through Him, with God the Father rather than the real realisation of sin, the need for repentance and redemption and the living of lives holy and pleasing to God. It is my deep conviction that anybody can be won to Christ if you discover the key to his or her heart. . . . It may take some time to identify it. But the most likely place to start is with the persons felt needs. One would imagine that hoards of fair weather Christians would be of concern to churches. While no church likes to be described as two kilometres wide and two centimetres deep but the sad fact is that overselling the promises of Scripture and being light on commitment makes strong commercial sense. Church growth is about numbers and even with attrition, the remainder are more than enough to ensure increasing numbers. Once inside the church, a non-stop stream of activities conveys the very strong impression of urgency and a pressing forward in fulfilling the divine mandate. The relational gives way to the programmatic and the lines between corporate and spiritual endeavours become blurred. Yet all of these are seen as positive developments leading individuals to greater dependence on God. The centrality of the individual has other implications. Charisma, eloquence and affability of church leaders are at least as, if not more, important as the fruit of the Spirit, knowledge of the Word and zeal for His Kingdom. Personality cults form around those who are particularly successful. With increasing individualism comes ever increasing proportions of blockers, aggressors and dominators, egos can run rampant leading to problems in church governance, including dissention, rivalries and splits.4 Moving within the confines of comfort zones of individuals becomes important and this can lead to an exclusivist and enclave mentality. Yet another manifestation is that some Christians adopt a highly mystical form of the faith to a point where there is virtually the practice of Christian magic. This creates the impression that it is possible to resolve all types of problems with the right prayers taking the place of spells, formulas and invocations. Obviously, the promise of formulaic solutions and instant gratification are hugely appealing but while it is not entirely out of the question (given a sovereign God), it can also give a totally false assumption. It must be said that most of those whom God has called to operate in these ministries dearly love the Lord Jesus and want nothing more than to bring glory to His name. Nevertheless if one starts out with an unbalanced view of the Scripture and what God intends for mankind, it becomes almost natural for errors to compound and snowball. Promises become claims, and claims become presumptions. These lend themselves to ever more extreme interpretations of what are required for prophecies to be fulfilled, sicknesses to be healed or miracles to happen, and why they do not happen. The latter, in particular, have had troubling consequences for the church, as when someone who is sick is instructed to exercise faith and refuse medicine and then dies. If this sounds highly critical it is not meant to be. None of these complaints are particularly new and in practically every age there have been many more who were attracted by the message of the gospel than were taken by the life of discipleship. By the operation of grace, the Malaysian church has had much to offer and much to celebrate. God has called many leaders of quality and this has given a depth and maturity to the church and its constituents that is praiseworthy. Whether all of this is backed up by collective character that expresses Christ-like attributes, glorifies the Father and draws mankind back to Him, however, is another matter. Like it or not, the church has many times indicted itself through exceedingly poor witness. It behaves with an imperious arrogance that courts cynicism and disdain. It repels rather than invites. This witness almost seems to transcend its spiritual condition, that is, whether the church is in red-hot revival or cold-blue sleep. But if nothing else, the past millennia show that God accomplishes His purposes despite a flawed creation. He merely calls churches to remain passionate, to be loyal and to endure to the end, which in the context of the growing persecution of the day meant exactly that. When all is said and done, perhaps this alone is the yardstick of whether the church has sufficient mettle: The willingness to lay down everything on the line without question or hesitation. 2 Rick Warren, The Purpose Driven Church, Grand Rapids: Zondervan, 1995, p219. 4 These are church management terminologies: Aggressors are those who raise rational objections in church and calling for compromise; dominators are those who insist that they are right and refuse to seek common ground; and blockers are the nay sayers in the church.